Digital Scotland's Brenda Conway with the Scottish Youth Parliament's Emily Davies; Year of Young People project worker Rebecca McQuaker; and Celebr ’18's Hannah Birse. Thanks to the programme, more than 890,000 premises are able to connect to the new network, which has now arrived in Dundrennan for the first time. Other areas to receive further deployment include Newton Stewart, Moffat, Beattock, Thornhill and Sanquhar. Each week the programme, one of the largest broadband infrastructure projects in Europe, reaches more remote and rural areas. Local people need to sign up for the new, faster services with an internet service provider, as upgrades are not automatic. 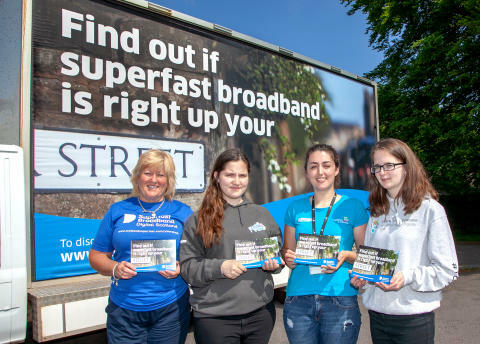 To help promote the fact that fibre is widely available in Dumfries and Galloway, the Digital Scotland Superfast Broadband team were out in Lochmaben and Dalbeattie this week. As part of the local rollout in Dumfries and Galloway some ultrafast Fibre-to-the-Premises (FTTP) technology is being deployed. FTTP sees fibre connected directly from the exchange to the premise and is capable of carrying speeds of up to 1Gbps2. FTTP is being deployed by the programme in only a handful of areas where it is the best technical solution for the area. Some properties in places like Cummertrees, Collin, Gatehouse, Kirkgunzeon, Kirkcudbright, Newton Stewart and Lochmaben are among those to benefit. “Many of these latest lines have been converted from a format once thought incompatible with high-speed fibre broadband, and we’re also increasingly using ultrafast Fibre-to-the-Premises (FTTP) to deliver the network directly into individual dwellings. “Finally, we are still bringing fibre to small communities like Dundrennan for the first time.